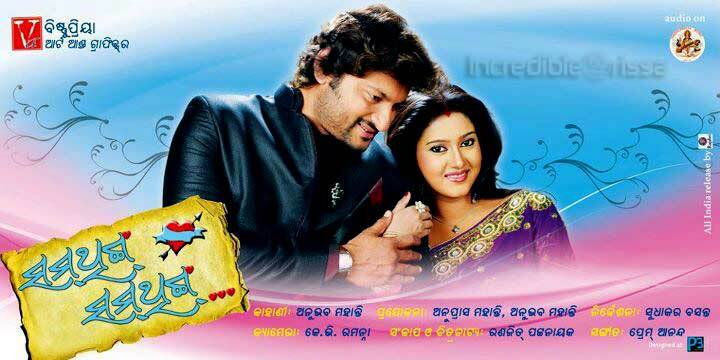 To listen and download Something Something Oriya Movie Songs, Visit our Oriya Songs Site. Something Something Oriya Movie is the new oriya film starring recently no 1 jodi of Ollywood Anubhav and Barsha with comedian Hari Mohapatra and bengali actor Ratan. After super success of Balunga Toka, Sudhakar Basant is repeating the lead pair in this film. Initially the film was titled as ‘Mr Bachelor’, then changed to ‘Dil Maange More’ and now finally as “Something Something”. Anubhav is also producing this movie alongwith brother Anuprash. He named his production banner in the name of her grandmother as Bishnupriya Arts & Graphics. Shooting of this movie was started from 28th of this month October and will be released on New Year i.e. January 2012. Music director Prem Anand composed six romantic and peppy tracks for this film in the voices of Ira Mohanty, Udit Narayan and Sricharan. The film’s story is based upon oriya village living style where Anubhav’s name is ‘Purusottam’ and Barsha’s name is ‘Bhumisuta’. Everyone expecting much more from this upcoming movie. I have not seen this movie. Bcz I stay in New Delhi. So there is no scop to watch this here but yes in feture if I will watch this movie then I will write something. Now its Agneepath’s time,releasing all most all(about 66 halls).After that still “something something”becomes the center of attraction for the odia people due to its beautiful story and atractive star cast(Anubhav and Barsha) and heart touching music.now in the 3rd weak all 4 shows running houseful in your nearest hall not believed check it now.So you(Anubhav and Barsha) are the best pair i have ever seen in the ollywood industry.God bless you. Love u Barsha, will love always,till my end and even after that one thing to u that u beauty do all the pictures with Anubha bcoz u two in our industry which movie is running two to three months successifully.its TANA frm kendrapara. I LIKE THAT STORY AND ITS SO VERY NICE STORY,SENEARY IS VERY BEAUTIFU. Anubhav.Cong,for u r movie ss.Great jodi in Orissa.But I miss the movie. Kaas ss delhi maine bhi release ho. Mast picture nischaya heithiba.. Best of luck anubhav bhai for your debut in producing and story.. Sir yeh picture bahare mane Hyderabad, Delhi, Surat emiti jagare bi release karile bahut bhala huanta, ye sabu jagah re bi odiya loka bahut achhanti ta shemane kebe miss karibaku chanhibeni, jadi apana release nakaranti tahahele ama manankara manare bahut bada ofsos rahijiba ki yete bhala picture ame hall re basi dekhipariluni. Mate T.V. Re film dekhiba bhala lageni. Anubhav I have seen your movies .lets us hope this movie also becomes smash hit in box office .I MAY CONGRATULATE YOU that you becoming a storyWRITER/producer writer .Some how you are also Co related to this picture .aap ki to nikal padi .I AM VERY MUCH anxious to know when you are becomg FILM DIRECTOR ,OK ANY WAY GODBLESS A HAPPY NEW YEAR STARTING BYE TAKE CARE OF YOUR HEALTH , DAY BY DAY YOU ARE LOOKING FAT PLEASE TAKE CARE EVEN BARSHA ALSO………………………………. I m your biggest fan from puri.something something super hitzzzzz…..
Story, screenplay nd Direction: Well presented. Anubhav bro proved himself again that he is the only one in Ollywood. Barsha didi nka role bahut bhala thila.Chota chota pila mane jaha kale mu ta khali aneiki thili..Hari bhainka role mote seteta impress kari parilani.Banku bhai nka bapa role bi sete bhala lagilani.Au Anubhab bhai nka jeje maa role jie karithile mote sabuthu bhala lagila. Jeje maa au nati ra combination mast thila.Starting suprerb.Ending also superb.Mada pieki Janda formula ,Au pila mane deithiba chithi, anubhab bhai nka school pant shirt moment mote besi prabhabita karithila. Balunga Toka ra bhula ru sikhi thik kari thibaru thanx a lot director nku.Dress au costume upere tike dhyana diagale bhala huanta.Dialogue pura mobal. Ranjit Patnaik sir nka kalama ru jhari thiba sabu line mote bahut bhala lagila. 1st half full mobal. 2nd half ta thu tike adhika..
One of the finest movie I hav ever seen. Don’t think so much. Just Go nd watch it. U both are most favourite for me,I never miss any movie of yours.This film will be also Bumper hits.I also congrats u for your producer step. filmta tike sighra release karantu..au wait kari hauni. Hi, Anubhava bhai the best actdress in oriya industary. I pray to God bless him at least I hope that he great history in life. Hi, I am very much waiting to see the picture, Anubhava bhai the best actdress in oriya industary. I pray to God bless him at least I hope that he great history in life. have good movie something something. please UPLOAD this movie SONG. somethng somethng g0ona b super hit . Barsha is superb n anubhav toh mind blowing . . Good luck fr ur future both of u. When r u gettng married ? Thanx anubhav bhai .ss jarur hit hoga. anubhav & barsha the jodino 1 not compare with any other 3rd class artist of ollywood …………..
we r eagerly waiting for this movie…….as usual its going 2 b a blockbuster in OLLYWOOD again……….FAPUN BHAI and BARSHA DI vil rock again………. main ajj tak jitna bi movie dikha hun.sub anubhav ka hi dekha hun…kyun ki anubhav bhai jo bi movie may acting kerte hai wo sub super dupper hit hota hai………..
Blunga toka super duper hit ho gaya hai…..SOMETHING SOMETHING movie jarur hit hoga……. so mr.deep which oriya film is not copied and as balunga toka concerned it’s the first film released in 51 halls,record breaking collection of all time. till today at 4th week it’s running housefull all 4 shows.not believed check today………….